On his return to Spain following his first voyage to the New World, Christopher Columbus's ship entered a severe storm. Columbus threw a report of his discovery along with a note asking it to be passed on to the Queen of Castile, in a sealed cask into the sea, hoping the news would make it back even if he did not survive. In fact, Columbus survived and the sealed report was never found, or at least, its discovery never reported. The English Navy used them. In the 16th century, the English navy, among others, used bottle messages to send ashore information about enemy positions. Queen Elizabeth I even created an official position of "Uncorker of Ocean Bottles", and anyone else opening the bottles could face the death penalty. You never know where your message will wind up. In 1784 Chunosuke Matsuyama sent a message detailing his and 43 shipmates' shipwrecking in a bottle that washed ashore and was found by a Japanese seaweed collector in 1935, in the village of Hiraturemura, the birthplace of Chunosuke Matsuyama. On June 10, 1914, a scientist from the Glasgow (Scotland) School of Navigation cast 1,890 bottles into the ocean to test undercurrents in the seas around Scotland. One of those bottles was recovered in 2012, and was confirmed by Guinness World Records to be the oldest message in a bottle ever found--98 years. The bottle was found east of Shetland by Andrew Leaper, skipper of the Shetland-based vessel Copious, the same fishing vessel involved in the previous record recovery. The previous record was a find that spent 92 years 229 days at sea. 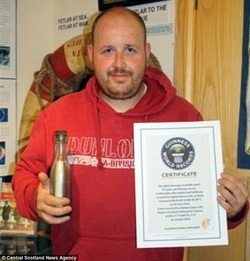 A bottom drift bottle, numbered 423B, was released at 60° 50'N 00° 38'W (about halfway between Aberdeen, Scotland and the coast of Denmark) on April 25, 1914 and recovered by fisherman Mark Anderson of Bixter, Shetland, UK, on December 10, 2006. In December 1945, American World War II veteran Frank Hayostek tossed a bottle over the side of his ship. It was recovered by an Irish milk maid, Breda O'Sullivan who set off an exchange of letters that lasted seven years before the two finally met amid an international media circus. Despite (or perhaps because of) the media attention, the two were never able to get their romance off the ground. The thought of finding a message in a bottle floating in the water, written by someone in a far off land, might seem far-fetched but that’s exactly what happened to one local kayaker. Almost every day, if it’s not storming, 77-year-old Oceanside resident Sonja van Hall kayaks from Oceanside Harbor out a few miles into the ocean. During her time outdoors in the water, she loves seeing whales, dolphins and birds. She often picks up cans and bottles floating along the water, doing her part to clean up the Pacific Ocean. But last week, as she headed toward the pier, van Hall came across a very unlikely surprise. She found two letters that had been rolled up and tied with red ribbons, stuffed into a bottle floating in the water. “First [I found] one bottle. I could see there was a message in it, but I couldn't open the bottle. Then I found a second bottle and then I got so excited,” explained van Hall. Turns out the mysterious messages inside the bottles were sent by two 10-year-old boys, elementary school students from Katikati, a town that’s a two-hour drive from Auckland, New Zealand. Written in April and May of this year, the letters managed to make it all the way here, to the waters off Oceanside. “Those boys from New Zealand must be as ‘whoopie!’ excited as I, but I havent' heard from them yet,” van Hall told NBC 7. She said it appears the letters inside the bottles were intended to be a time capsule of sorts. The letters begin with the greeting, “Hello, future!” They go on to describe current technology and everyday life, and include pictures of electronic gadgets and their current prices. For van Hall, finding the letters just gives her another reason to love going out into the water every day. “It’s the unexpected, it’s the magic of the ocean,” she said. Merle Brandell was beachcombing near the village of Nelson Lagoon, Alaska when he spotted a bottle that caught his eye. He picked it up and noticed there was a note inside. The note was ripped at the seams and appeared to be old. The note had no date other than a return address to North City Elementary School in Shoreline. 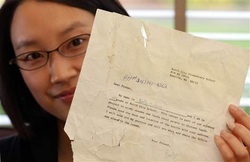 34-year old Brandell immediately wrote a letter to the school explaining how he found the letter 1,735 away in Alaska and much to his surprise 30-year old Emily Hwaung responded ecstatic to find out that her 20 yr. old letter was found years later. A gift from her grandparents. A four-year-old girl from Tamworth was shocked to receive a reply all the way from Australia after throwing a message in a bottle into the sea. 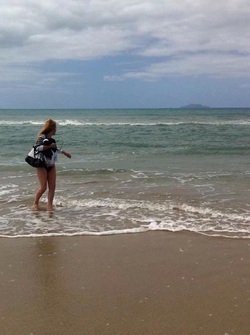 Jasmine Hudson was on a family holiday in Bournemouth when she threw the bottle from the pier on the 10th April 2012. Jasmine received a kit from her grandparents, and wrote a message including her name, age, address and where she had thrown the bottle into the sea. She hoped it would reach her Aunt Jodie who lives in Guernsey, but four months later she received a letter in the post from a woman who found the message in a bottle as she walked along Largs Bay Beach, South Australia. The woman who found the message was a grandmother called Barbara Richards who was taking a stroll along the beach with her brother. She wrote to Jasmine to tell her she had found her message. Dear Jasmine, As fate would have it we have been introduced to each other by your message in a bottle, Bournemouth Pier looks very interesting. I searched online on the computer to find out what I could, yes the pier exists and yes your address was there too. 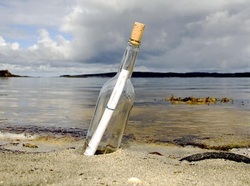 Your message in a bottle took five months to float up on Largs Bay Beach in South Australia. My name is Barbara. My brother Colin and I were walking along the beach for some exercise collecting shells and reminiscing about our childhood when I saw your little bottle. I scooped it up and we drove home with it where we opened it. I must share with you that I was so excited to find a message in a bottle. I hope my note finds you well and brings you joy to know it has landed safely into my hands on the 13th of September 2012. If you would like to communicate I am also on Facebook or just write and let me know you received my note. Until then I wish you well, stay safe. Jasmine is now writing a special letter back to Barbara and they are planning to talk on Skype to one another. Jasmine says that she plans to send another message in a bottle soon and would quite like a reply from Brazil this time. 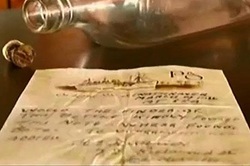 A message in a bottle found floating in the ocean has been returned to the family of the man who wrote it after 76 years. 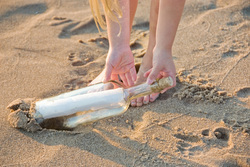 Geoff Flood was walking on the beach at Ninety Mile Island, NZ when he discovered the bottle. Inside was a note on P&O headed paper, carrying the ship’s name SS Srathnaver, and the name H E Hillbrook. Mr Flood set about investigating who Mr Hillbrook was, discovering that he was a Mr Herbert Ernest Hillbrook, who had passed away in the 1940s. He contacted Herbert Hillbrook’s family, and returned the bottle and message to his grandson Peter, who lives in Perth, Australia. “The only connection I have to grandfather now is that bottle,” Peter Hillbrook told Sky News of the astonishing discovery. Florida to Ireland in 16 months. A message in a bottle sent from Florida in 2009 has arrived in Ireland, 16-months after being tossed into the Atlantic Ocean. It wasn't exactly an S.O.S., but someone finally received a teen's message in a bottle after 16 months at sea. The old-fashioned long-distance callout was tossed into the Atlantic in 2009 in Florida, and made its way north to the shores of Ireland. The bottle, sent out by then 17-year-old Corey Swearingen, and was discovered by a boy and his father, who stumbled upon it while visiting the shore. 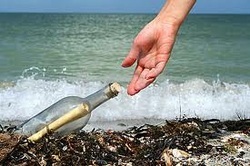 "Neither I nor my son has ever found a message in a bottle before, but it was always a dream to do so," said Stephen Flannery of Athlone, Ireland. He and his son, Adam, 17, made the discovery near Keating's Pub, in Kilbaha in County Clare. 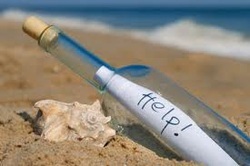 "Please DO NOT throw this back in the water," the message in the bottle pleaded, requesting that whomever found it e-mail or write, noting the date and location where it was found. "I didn't expect it to be found at all," said Swearingen, now 18 and a freshman at Florida Atlantic University. "Who would've guessed that it would end up in Ireland?" I lost my Father in September 13th 2013. He was very special to me. Before he died, he asked me to make sure his best friend could do his Eulogy, but sadly this couldn't take place, it broke my already broken heart, more. It was a very emotional day, but it was the best thing I have ever done, and I know that. Sitting on the beach I loved, in the warm, soft, silky sand, beside my best friend, thoughts only on sweet childhood memories with my Dad, the fishing, the swimming, all Dad was, all he taught me. I knew the time was now. Pulling out Dads friends Eulogy, and my letter to the ocean I wrote also. I undid the bottle. Sliding the Eulogy in the bottle, and it glided all the way through, followed by my farewell, together as one, I prayed. I then closed the lid, nice and tight, kissed this now important bottle, and we walked hand and hand the bottle and I, to the sea. The tide was perfect, the weather, all I could ask for. I stood in the ocean and never did I take my eyes off Dads Bottle, as Dads ship left the harbour...over the waves, bobbing up and down, I remember the sand and my feet shifting and sinking, over and over, steadying myself again, looking for Dads Ship...off it went. I returned to the place I sat earlier with my friend by my side, I cried, not because Dad was gone, but because, Dads journey had only just begun.